An IT department disavow ? If the marketing or the communication has taken the lead about digital issue, it’s because It department has been disavowed in their choices (even if some CIO has understood that they have to make their job position evolve to a more strategic and advisor role, instead of a doer one). A lot of IT departments continue to run project as usual on mode : People have to use this tool, they have no choice (which is a misunderstanding about collaboration), why organize something else of tool training. With of course those who whish to develop their own platform. That’s for these reasons that more and more the communication department with the business lead now collaboration project (most of the time HR is still missing since many years), and the IT is more an advisor to help to select the right tool. If this description is a little bit distorted, it shows that there is an understanding that digital project are more about business needs and usages than about tool. But it the same time, Gartner announces that 80% of the collaborative project will fail because of a tool focusing. It shows, that some issues are still not solved, like employee engagement, more than a platform adherence. The IT is not the only one to question for that, leadership issue is a corner stone as well, that’s why a real success is too often anecdotal : tool is still in the center of the game. The rise and fall of the digital worplace project ? But people, organization, as usual, are forgotten in favour of the tool. The IT department comes back, with the will to plug all these new tools with the existing one, with the same mindset unfortunatly, most of the time, that was existing in the 2000’s with the trend of intranet portal. Here we go again, with specs, tunnel effect for several month, as if the failure of that type of project has never existed… People/users are lost somewhere in the limbo of the digital. 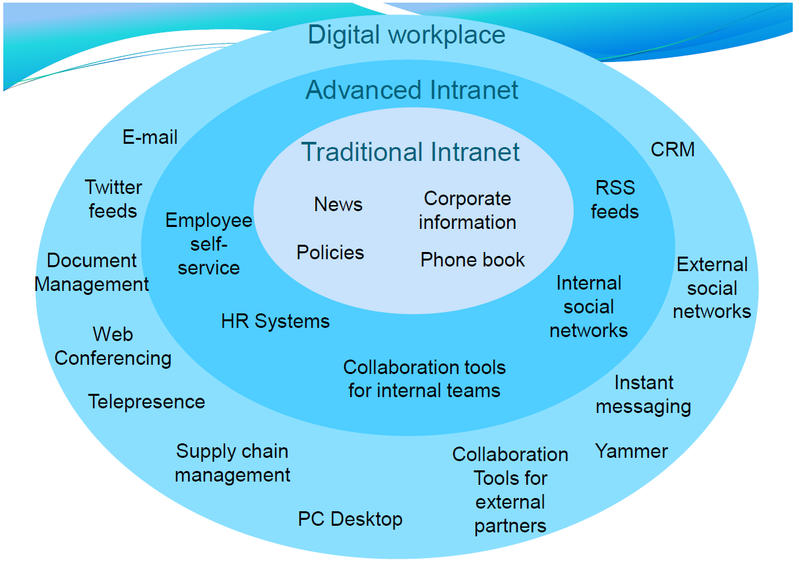 The understanding that the success is not related to numerous features has been forgotten with this new Grail, the digital workplace. The speech has evolved, not really the practice. It’s a kind of revenge for the IT department, which drawn the communication and the business with its tool expertise to keep the biggest part of the budget of the project. We are only at the beginning of most of the digital workplace project, may be the IT has learnt from previous failures, or same approach, same failure ? Ce contenu a été publié dans enterprise 2.0, Post in english par Anthony Poncier, et marqué avec collaboration, digital, digital workplace, enterprise 2.0, enterprise social network, social business, transformation. Mettez-le en favori avec son permalien.